The Squak Mountain forest parcels were saved from clear cutting because The Trust for Public Land has agreed to purchase the land and hold it for later purchase by King County. Funding for the King County purchase will come, in part, from a renewed parks levy. To ensure the Squak Mountain forest lands are acquired and preserved, King County must have adequate funds. Please cast a “Yes” vote for the Parks Levy, Proposition No. 1, in the August 6 primary. Don’t forget to mark and mail your ballots in before Tuesday. Thank you! WHEN YOU VOTE, remember that King County Councilmember Reagan Dunn pledged his support to Save Squak early and publicly, in a February 19th speech given to the Issaquah City Council. WHEN YOU VOTE, remember that King County Executive Dow Constantine signed the agreement with the Trust for Public Land and landowner/logger Kurt Erickson, agreeing to purchase the 216 acres of threatened land on Squak Mountain. Save Squak endorses both Reagan Dunn and Dow Constantine in their bids for re-election and Save Squak lauds them for their conservation efforts here and throughout Greater Seattle. A New Clear Cut Permit has been filed by Erickson Logging for 95 acres on Squak Mountain. Possible habitat for the Marbled Murrelet and other land conditions seem to have spared much of the 216 acres for now. However, this new application includes 95 acres. Significant steep slopes and areas alongside streams are included in this planned harvest which would be conducted along SR 900 in Issaquah. Our position is unchanged. These parcels are not suitable for a clear cut timber harvest based on their topography and their geology. They are not suitable due to their proximity to major population centers, major transportation routes (SR 900), key wildlife corridors, and existing State and regional park spaces. Soil erosion possibly leading to landslides after heavy rains would impact travel on State Route 900. Heavy equipment and log hauling trucks entering and exiting SR 900 (Renton Issaquah Road) would certainly congest traffic (grumble, grumble). 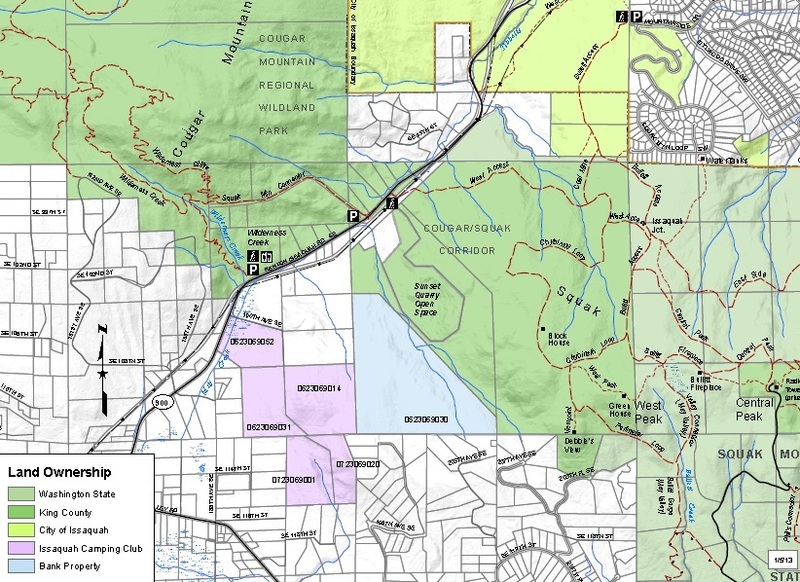 Flooding concerns for May Valley are not diminished by this planned 95 acre clear cut. Bottom line. The logger wants to sell this land and King County has expressed their interest in buying it for public parks. Let’s continue to raise public support and enlist conservation groups like Mountains to Sound and Forterra to get this deal done quickly. This could be a “Win Win” deal. It doesn’t look like we have much time as the deadline for comments appears as of now to be Tuesday, April 16, 2013. Start writing now! Click to download a copy of the new Erickson permit application to clear cut Squak Mountain. A CLEAR-CUT LOGGING PERMIT HAS BEEN FILED, requesting a 95% timber harvest on 195 of the 216 acres on Issaquah’s Squak Mountain. The DNR regulations are quite complex and how the 5% retention figure is calculated has to be one of the more complex issues. There are two classes of retained trees, “green wood” and “wildlife”. There are size requirements and some trees in buffer areas can be double counted. We hope to provide more details on forest practices regulations. Squak Mountain is a serene urban forest in the Greater Seattle area, most of which has not seen logging for perhaps 100 years, or more. Washington State DNR Forest Practices confirmed the State’s acceptance of the application as complete when it was filed on February 26th. The permit is now in the 30 day review process, and with approval logging can begin as soon as March 27th. PUBLIC COMMENTS are being accepted during this review and may be submitted by emailing BRUCE.McDONALD@dnr.wa.gov and JAMES.HEURING@dnr.wa.gov. You may also reach them by phone at 360-825-1631. Emails or letters are preferred to ensure all comments become part of the public record. You may refer to record permit number 2415960, OR you may reference the Erickson Logging parcels formerly owned by the Issaquah Highlands, LLC. The usual comment period is 14 days but we have been advised that the State DNR expects to accept comments thru the end of the 30 day review period, which ends on March 27th. We need your voices! HELP!